We’re on rabbit watch, day 3. I don’t mean to get so involved in Duchess’s birthing process, but it’s her first litter and, well, I get excited when there are baby bunnies floating around! Duchess is not cooperating. I put more alfalfa hay on the floor of her cage in hopes she’d gather it up and put it in her nestbox… she didn’t.But she did enjoy her tasty snack! 1. 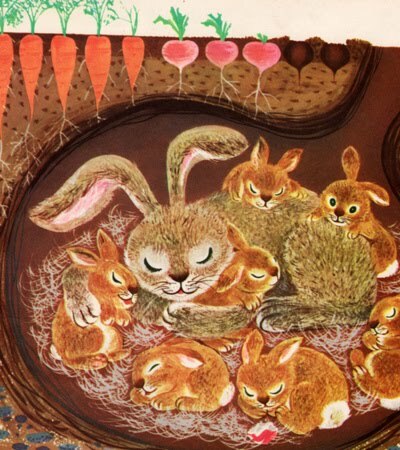 Every rabbit has a different gestation length. The average length of a rabbit pregnancy is 31 days, although the range is 28-35 days. Let me tell you, the difference between 28 and 35 days is a l o n g time when you’re checking your rabbit every few hours! 2. Pulling hair is spontaneous. Some rabbits will pull their hair and prepare their nestbox several days in advance. This is a well-prepared, type-A rabbit. Then there are the free-wheeling, fun loving rabbits who pull their dewlap fur an hour before birth. Ellen of Sky Island Livestock told me she has does who will pull their hair as they are giving birth. Talk about procrastination! 4. Test mating might get you more than expected. We bred Duchess, then did a test breeding on day 12 to see if she was pregnant. Turns out the mating activity will stimulate one side of ovaries at a time – and the “test mating” recommended by so many people might actually trigger a second fertilization. Let me put it this way: a rabbit is capable of carrying two pregnancies, simultaneously! So there’s a chance Duchess is about to deliver a litter… and in two weeks she’ll deliver another! I’ll let you know how it goes. 5. When in doubt, send up a prayer and wait. The reality? I can do absolutely nothing to help Duchess right now. Once she births there’s a chance I can save the kits if she has them on the cage floor instead of the nestbox. Still, it’s a waiting game. Those babies will come when they want to come and I’m along for the ride. Patience, patience, patience. I’m developing this virtue! Do you have any stories of first time rabbit deliveries? 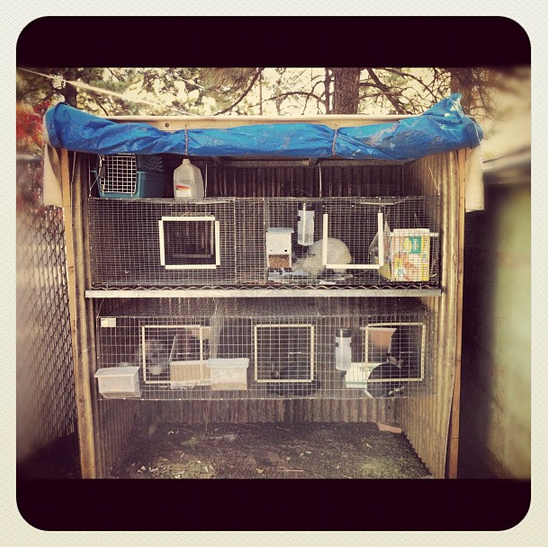 Now that winter is upon us, we take a few different precautions winterizing our rabbits. Rabbits thrive in cold weather, but it still makes sense to make sure you don’t wake up one morning after a frigid night and discover your livestock frozen solid! Our hutch is a double-decker, lean-to style. The sides are made of T11 insulating material with corrugated fiberglass interiors. We’ve attached a heavy tarp to the front of the hutch that can be dropped down in driving rain, super snow, or during our terribly windy spring days. We also give each of our rabbits a box stuffed with hay for the below-freezing weather.